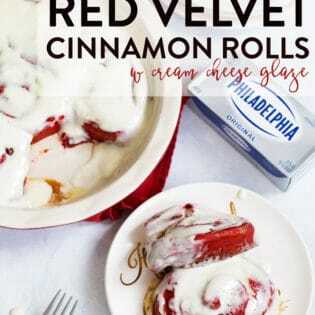 Creamy red velvet cinnamon rolls with cream cheese glaze recipe. Yummy brown sugar, cinnamon, and cream cheese make this a special treat for Christmas morning or a holiday party. In a large pot, add the whole milk, oil and 1/2 cup of sugar. Scald the mixture. What this means is that you will heat it right before it boils. The sides will become frothy. Take the pot off the burner and let sit until it’s lukewarm, it should take roughly 45 minutes. Once the milk mixture is warm, not hot, add the vanilla, and the food dye. Start with red. I used the no taste variety and used a lot of red. I put a few dots of the black gel food coloring to make it a deep red. Play with the color until you get it right. Add the quick rise yeast, let it sit for a minute to expand and then add four cups of flour. Stir with wooden spoon to combine. Cover with a tea towel and let the dough rise for an hour. Add the remaining 1/2 cup of flour, baking powder, baking soda, and salt and mix together (it's quick when you use a stand mixer). Roll the dough out to a large rectangle. In a separate bowl, add the melted butter, brown sugar, and cinnamon and pour over the dough. Spread with a spoon. Take the softened cream cheese and spread (to the best of your ability) over top of the buttery brown sugar mixture. Roll the down towards you. Seal the seams and ends by pinching them. Grease a few pans with melted butter or nonstick spray (you'll need a few, I used four of various sizes). Add all the ingredients in a stand mixer and beat with a wire whisk until smooth.